Can You Use Beach Sand for Bearded Dragons? 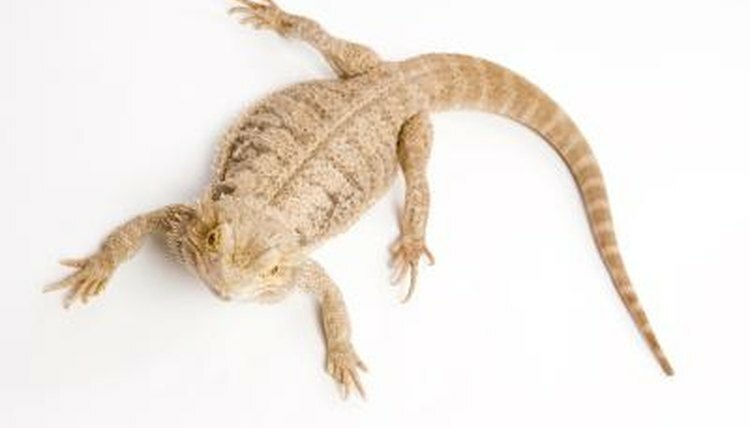 Veterinarians, breeders and keepers of bearded dragons disagree about the best substrate to use for their maintenance. Some advocate the use of sand, while others feel that sand can cause health problems -- especially impaction resulting from ingested sand. It is important to understand that not all sands are created equally, and while some may be relatively safe to use, others can be harmful and cause life-threatening complications for your pet. For keepers wishing to use a sand substrate for their bearded dragons, it is best to use play sand. Do not collect sand from a beach for your bearded dragon's cage. This sand may have glass or other inorganic items in it that may injure your lizard; additionally, the sand may be contaminated with bacteria or other pathogens. Some beach sand is sold commercially; if the sand has been sifted and heat sterilized it is less likely to cause your bearded dragon health problems. Any particulate substrate carries an impaction risk with it. Minimize these risks by using sand that has very small particle sizes and by placing your lizard's food on a paper plate or dish. Additionally, avoid using particulate substrates with young bearded dragons -- their digestive systems are smaller than those of adults, so they are at an increased risk of ingesting something that gets stuck. Another risk-mitigation strategy is to sift the sand through a very fine sieve to remove any large particles in the sand. Live Science: Science of Summer: Where Does Beach Sand Come From? What Kind of Sand Is Safe for Snakes?